We are all told that dietary fiber is good for us, but are all sources and forms of fiber equally beneficial to health? Studies by researchers at the University of Toledo (UT) have surprisingly found that mice developed liver cancer (hepatocellular carcinoma; HCC) when fed on diets fortified with refined soluble fibers such as inulin, a probiotic that earlier this year was FDA approved to be marketed as health-promoting. The research, headed by Matam Vijay-Kumar, Ph.D., director of the UT Microbiome Consortium and associate professor in the UT department of physiology and pharmacology, was originally designed to investigate whether a diet enriched with inulin might help to combat obesity-related health issues in mice, and the results did show that the inulin-rich diet helped to reduce obesity levels in a mouse model. 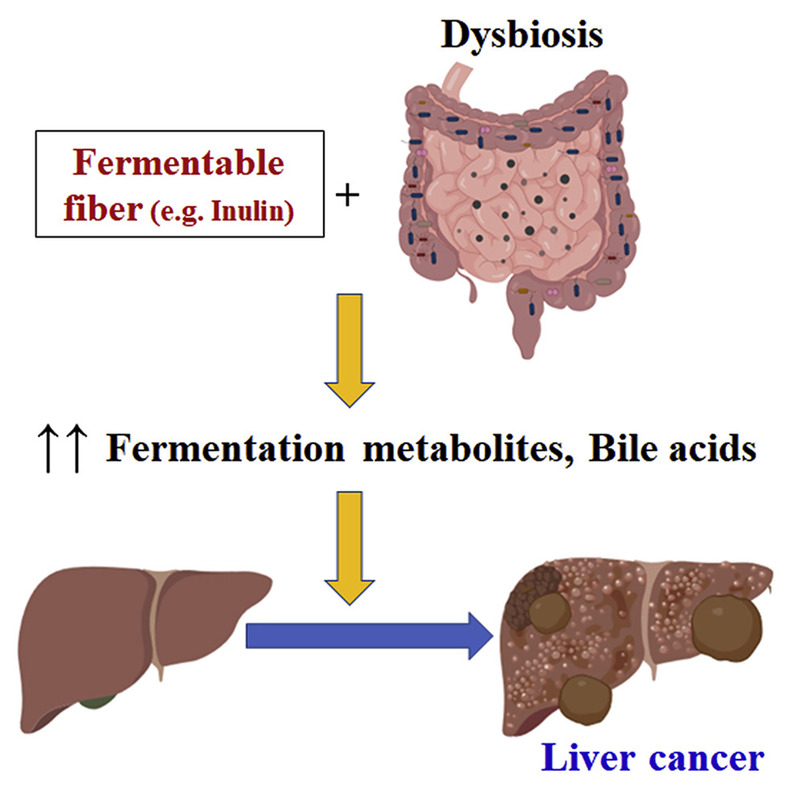 But the experiments also found a clear association between dietary inulin and the development of liver cancer in mice that had altered levels of gut bacteria that could ferment this type of refined soluble fiber. Westernized diets typically include increased amounts of processed foods that are high in fat and sugar, in parallel with reduced consumption of grains, fruits, and vegetables that are naturally high in fiber, the authors explain. This dietary trend has been linked with the well-documented increase in the prevalence of obesity and related metabolic diseases. “One seemingly logical and practical approach to counter some of the unhealthy effects of ’western diets’ might be to enrich processed foods with plant-derived fibers,” the researchers suggest. Dietary fiber comes in two basic forms, soluble fiber, which can be fermented by gut bacteria, and insoluble fiber, which is not fermentable. Inulin is a soluble prebiotic fiber that is metabolized by the gut microbiota to produce short-chain fatty acids (SCFA), and SCFAs have been found to play key roles in gut and immune system health. “Such effects likely contribute to inulin’s beneficial metabolic effects, which include reducing adiposity and improving glycemic control,” the authors note. They set up a study to see if the refined, fermentable fiber inulin and the resulting SCFAs generated might prove effective against metabolic syndrome in a mouse model of obesity and metabolic syndrome. The results confirmed that adding inulin to their diets did reduce adiposity in about 40% of animals, compared with adiposity observed in mice fed a grain-based diet. The inulin-fortified diet was also linked with improved glycemic control. However, adding inulin to the animals’ food also had the “highly disconcerting effect” of inducing cholestasis, leading to HCC in mice that were kept on the diet for six months. Mice that were prone to HCC exhibited gut altered gut microbiota, or dysbiosis, characterized by increased fiber-fermenting bacteria and proteobatceria, and this suggested a link between inulin, bacterial fermentation, and HCC. The possibility of an association was strengthened by the finding that inulin-fed mice that were treated using broad-spectrum antibiotics to reduce gut bacteria didn’t develop HCC. Germ-free mice that completely lacked gut bacteria were also free from liver cancer after being fed an inulin-enriched diet. And when the scientists added dietary beta-acids derived from the hop plant Humulus lupulus, to inhibit fermentation, inulin-fed mice were again spared from developing liver cancer. “Strikingly, feeding beta-acids to inulin-fed mice averted liver cancer, which further reinforces our hypothesis that gut bacterial dysmetabolism primarily driving liver cancer in these mice,” comments Vishal Singh, Ph.D., a Crohn’s and Colitis Foundation Fellow at the University of Toledo, and co-lead author of their published paper.